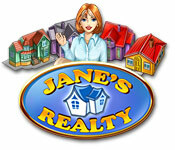 Jane restored her family hotel business and now she`s ready to expand an entire city. First, she`s got to manage major construction then move on to remodeling and renting homes. Help her learn the ropes by buying constructible surfaces and upgrading resources. The payoff is a modern town with magnificent infrastructure, and 24 professional levels in Jane`s Realty, a Time Management venture.